I got a bit hot under the collar over the business of my article in The Australian, so thought I'd calm down by recommending some nice CDs for you. The youthful Pole Rafal Blechacz was the winner of the last Chopin Competition in Warsaw and this is his first CD: it's pretty stunning. Beautiful tone quality, plenty of variety and an individuality which feels like a genuine response to the music - for example, a marvellous grandeur about the A flat major Polonaise. The Szymanowski variations are fascinating. I think we'll be hearing more of this fellow; I certainly hope so. This is Elektrafying: Semyon Bychkov and the WDR in Strauss's completely OTT masterpiece, starring a nuclear-powered trio of Deborah Polaski as Elektra, Anne Schwanewilms as Chrysothemis and Felicity Palmer as Klytemnestra. If an ideal of Greek drama was catharsis, I'd say this does it: after listening, I felt exhausted, exhilarated and, peculiarly, less stewed up than usual over daft things in the rest of my life. Watch this space in a few months' time for an explanation of why my new name for Maestro Bychkov is 'The Big Cheese'. Last but not least, here's one of the latest and best from the LPO's own label: Vladimir Jurowski conducts Tchaikovsky's Manfred Symphony, live at the Royal Festival Hall. It's a glorious piece - I urge you to hear it if you don't know it - full of Byronic angst, high drama and marvellous melodies. Vladimir shapes and paces it with enormous intelligence and sensitivity. Marvellous despite the less than ideal acoustic (hopefully when the RFH reopens next year, that pigeon-hitting-wall deadness will be a thing of the past). A little idle surfing yesterday produced some information that gave me a pleasant surprise: a Google search on 'classical music blog' produces (!drumroll!) JDCMB at the top of the pile. I have no fond illusions of grandeur, though: I reckon it's simply because my title includes the words 'classical music blog'. I can assure everyone that there was nothing 'clever' about the way I chose the name in March 04. JDCMB came into being almost by accident. Blogs weren't as much of a global phenomenon then as they are now and I'd never thought of looking for any devoted to classical music. In a quiet patch following some intensive work on Ravel, after which I felt a little flat, I thought I'd investigate Something New and logged on to Blogger to see how these funny things called blogs worked. Next thing I knew, a prompt was asking me to choose a name for my blog. I didn't know that other similar sites might have poetic, meaningful titles, so I typed in the first thing that came into my head: Jessica Duchen's Classical Music Blog, which seemed to say everything anybody needed to know. Bingo: one blog. Nobody could have been more surprised than I was. And here we are. 27 July: RITES OF SPRING paperback release day! As of now, I'm a real Paperback Writer! Amazon has been selling the thing for a while already, but this is the date when it's supposed to hit the physical bookshop shelves. Fun at the opera? Heaven forfend! I'm going to start eating those Sussex hats: The Guardian has only given 3 stars (out of 5) to 'Betrothal in a Monastery'. The objection is that the work itself isn't political enough. This opera commits the cardinal sin of being FUN. Come to think of it, with the Guardian one could perhaps predict this attitude. Entertainment in the opera house? How utterly, utterly dreadful! What a horrendous thought! You take an afternoon off work, spend all that money on a ticket and hiring your tux, pay for champagne & dinner & the ruinous programme, and then the company has the affrontery to ENTERTAIN you?! In Russian? Oy vay!!! I predict deep suffering amongst the critics at tonight's Prom, where Juan Diego Florez is singing bel canto arias and Latin American songs that might just be enjoyable. UPDATE 26 July, 1.30pm Hooray for The Independent: Edward Seckerson got the point and catches the spirit. UPDATE 31 July, 2.15pm: Hugh Canning of The Sunday Times must have been in a very, very bad mood. Perhaps a combination of the ridiculously high summer temperatures we've been having and an overdose of Russian? The shop address is 2-6 Hill Street, Richmond, Surrey, and it's less than ten minutes' walk from Richmond station (District Line, Silverlink Metro & South West Trains). This was in The Independent last Monday: I picked out just a few of the novelists whose fiction best captures the intangible power of music, and added Jilly Cooper for the sake of a good contrast. Just back from dress rehearsal of Prokofiev's 'Betrothal in a Monastery' at Glyndebourne. If it isn't the hottest ticket in the country by this time next week, I will eat every hat in Sussex. Grab a ticket while you can, if you can. Bust every gut to get there. And if you know anybody in the highest echelons of the BBC or Channel 4, twist their arms until they send in the cameras. Seriously, where has this thing been hiding all these decades? I don't know for certain, but this may be the first time it's been performed in this country. So what other treasure-troves stayed hidden behind the Iron Curtain? I will write about it more fully once the show has opened. Heatwave and associated electrical stormy stuff has been having far-reaching results. Yesterday one was electrical trouble at Glyndebourne. The air-conditioning was one of the casualties; Tom & colleagues played in their shirt-sleeves. And my cousin found herself temporarily stuck in the lift. Hope all will be well today for the dress rehearsal of Prokofiev's 'Betrothal in a Monastery'. Meanwhile I went to Paris for the day to interview a Russian conductor, ended up cradling in my lap an object that had once belonged to Rachmaninov and returned home with a bag of French cheeses that, though wrapped in layer upon layer of cooling, sniff-proof material, still attracted a few interesting glances on the train. Fact of the week: Bertillon, the classiest ice-cream joint in Paris, is closed for the summer. Marketing logic, anyone? The title is Canciones Argentinas; the performers are Bernarda and Marcos Fink (sister & brother) and pianist Carmen Piazzini; the whole is to die for. I started listening to it this morning and am now playing it through for the 3rd time in a row. No sooner had I vanished into gloom and depression over the state of the outside world yesterday than my own situation brightened suddenly and considerably. My wonderful agent produced the news that I've got my first overseas deal: my second novel, due out with Hodder next spring, has been snaffled for translation by a publisher in Amsterdam! We cracked open some bubbly. Meanwhile the progress of RITES OF SPRING continues to be encouraging: The Book Place has picked it out in its choice of new popular fiction. It's also in the Amazon 3-for-2 special offer, rubbing shoulders with many wonderful books including two of my recent favourites (Sarah Dunant's 'The Birth of Venus' and Diana Evans's '26A'). Last but not least, I've just signed a second two-book deal with Hodder. Op.3 is already taking shape. And Op.4? Well, watch this space. The pace is intense - a book a year - and that one will probably be happening before you can say "Joanna Trollope". Dear friends, please forgive me for blowing my own trumpet today. I've spent my whole life working towards becoming a 'proper' novelist and I'm still finding it difficult to believe that such an amazing chance has come my way. Deeply distressed this morning by the news from the Middle East. I recently turned down the opportunity to go to Jerusalem to do an article about the Israel Philharmonic and its conductors. Had I gone, I'd have been there at the moment. I'm afraid I said 'no' mainly because I'd have had to miss the Wimbledon final, but there were other factors too and the incident has sparked some knife-edge discussions at home. As an objective journalist, I wasn't totally against the idea (though I don't deny being a scardycat). I can't pretend to have any answers, but I'd like to ask some questions. Music can rise above politics. Should it do so on every occasion? Should a flagship artistic organisation necessarily be tarred with the brush of its government in the eyes of the world? If someone is upset by Israel's actions and decides to boycott its national orchestra, but that person is equally upset by the actions of America in Iraq, should they not also boycott orchestras from, eg, Washington DC? And if they don't approve of Tony Blair's support for George W, shouldn't they extend their stance to avoiding Britain's state-funded orchestras too? Once you start down that path, where do you stop? Would it have been wrong to present the perspective of ordinary musicians, trying to get on with life and work, caught up amid surrounding issues so complicated and combustible? Shouldn't they be allowed to tell us what life is really like for them at the moment? And whatever stance they take, shouldn't they have the chance to say why they take it? I didn't go and I'm not going. Personal safety and tennis aside, was that the right decision? ...he'd probably be Juan Diego Florez. The effect is a little similar. 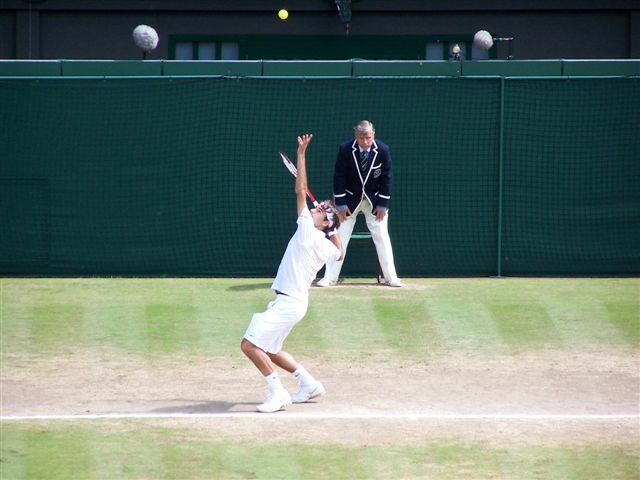 While Nadal was mopping his brow, obsessively tossing one ball aside and giving grunts that could have been heard across Wimbledon Common, Federer stayed as cool as a glass of Pimms, delivering shots so perfect that they could make your heart sing just like Florez's high notes. Even mine, and I'm not the sportiest gal on the globe. Watching the Wimbledon final live was totally different from watching on the TV. First, we weren't prepared for the noise when the players walked on, being used to concert applause from 2,000 rather than sports applause from 13,000. Next, the small screen simply can't convey what it must be like to have a 130-mile-an-hour serve flying straight for you, or what a feat it truly is to return some of those high-note shots. During some of the rallies, I had to hold my breath. I'd never expected to be so riveted. At this level, sport does become an inspired art. Having seen Wimbledon on TV so many times, it was great to discover that it's real; the atmosphere was fantastic, the band of the Royal British Legion was an added treat, and it was, I must say, all extremely civilised. A fantastic experience. The crowd backed Nadal, and he certainly put up a good fight, at least after the first set. Federer wasn't infallible, but at least that proved he was human. Above, Federer serves for the championship, photographed by the Tomcat (who maybe should have a new career as sports cameraman). It's the biggest sporting day of the year - possibly of the decade - with the World Cup Final tonight and the Wimbledon Lawn Tennis Championship men's singles final this afternoon. And by some mysterious quirk of fate, Tom and I are GOING to Wimbledon!!! ...and it's a tenor voice like this. Juan Diego Florez's latest album, Sentimento Latino, is out on Monday. If you like sun-drenched South American songs dressed up a bit and sung by a voice so honeyed and radiant that it's like magnetised massage oil for the soul, order it now. Today is the first anniversary of the 7 July London Tube bombings. A two-minute silence was held at King's Cross and most of us, thinking back, are feeling sad, defiant, angry and resiliant. We are proud of this wonderful, vibrant, multifaceted city with its millions of inhabitants of every colour, race and creed and will never forget those who died that day. The news has just reached me that the incandescent, inspirational mezzo-soprano Lorraine Hunt Lieberson died yesterday, aged 52. If this seems a brief post, it's because words sometimes fail in the face of such a catastrophic loss. Instead of carrying on, I'd like to redirect you to the obituary from the New York Times. I don't know what it is about the BBC Breakfast news guests, but they've been coming up with the kind of apt statements that you couldn't make up if you tried to. This morning they brought on a fashion historian to talk about the background to the bikini. It was invented by a Frenchman (naturellement), an engineer who'd inherited his mother's lingerie shop and wanted to attract new business. Less was more, but the time was wrong. "The original bikini was thirty inches of material and fitted into a matchbox," she said. "It did not take off." I have a very large pile of CDs to listen to this month for reasons I'll explain one day. The latest to hit the slot is this. Never having been the greatest fan of John Eliot Gardiner before, I approached it with some caution. Well, there's little on earth more beautiful than one of Bach's deep, dark oboe duets, and I am currently listening to one I have never heard before, from the cantata BWV23 'Du wahrer Gott und Davids Sohn'. These are beautiful performances, fresh and true, straightforward but tender, and the resonance of the chapel of King's College Cambridge prevents them from ever sounding excessively dry, as period bands sometimes can. What strikes me most is: this is WONDERFUL music, vintage Bach. As beautiful as anything in the St Matthew Passion, I'd say. Uplifting, soul-cleansing, radiant music. And I've never heard it before. Even when I sat in the Pendlebury Library in Cambridge enduring that awful 1980s Harnoncourt Bach Cantatas edition with the out-of-tune choirboys - which was all that was available at the time - I didn't hear this piece. I heard many; I had favourites, one being 'Liebster Gott, wann werd ich sterben', which I later discovered was a favourite of Brahms's. Maybe he also liked oboe duets - that has one of the best. Is that perhaps where Brahms's beautiful writing in thirds and sixths originated - the Bach cantatas? Gardiner's Bach performances were recorded in live performance, as it happens. But live performance that is all too rare. What puts people off? The rarity, or, conversely, the quantity of them? JSB churned them out, week after week. The words? Can't blame anyone for not liking the words, but that's true of many operas too. The sentiments? Those don't stop any performances of the St Matthew Passion. Surely, surely, there can't be a prejudice among concert promoters against...OBOE DUETS? It's unthinkable. Then again, all things are possible in this world of ours.